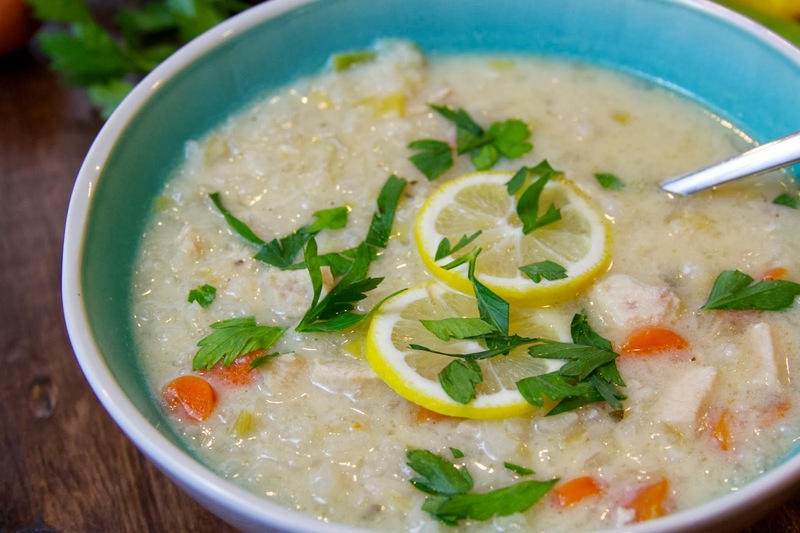 This week I found myself on a quest to satisfy a serious craving for Avgolemono soup (Greek chicken soup with egg and lemon sauce). Last Monday, I stopped at my favorite local Greek cafe for an early lunch. This little cafe, in my opinion makes the BEST Avgolemono soup and every time I have lunch there, I have to order a bowl. But this time, I was told that there was no soup! I was shocked and asked how it was possible that there was no soup, since the restaurant had just opened and I could see the pot of soup in the background! “Not ready yet!” was the answer I received. Flash forward to Saturday afternoon: I went there again, and ordered the soup and was told “No more soup until Monday!” “But I came in last Monday and you told me there was no soup!”, I whined. By this time, I was starting to think that something very, very Seinfeld-ian was going on. My hopes for soup were temporarily dashed, but then I remembered that it was the weekend for the Greek Food Festival, and surely I could get some Avgolemono soup there! Well, unfortunately that was not to be and I couldn’t find any soup there either, so it was obvious to me that I would have to make it myself. I made this soup this afternoon and it is creamy, lemony bliss in a bowl! 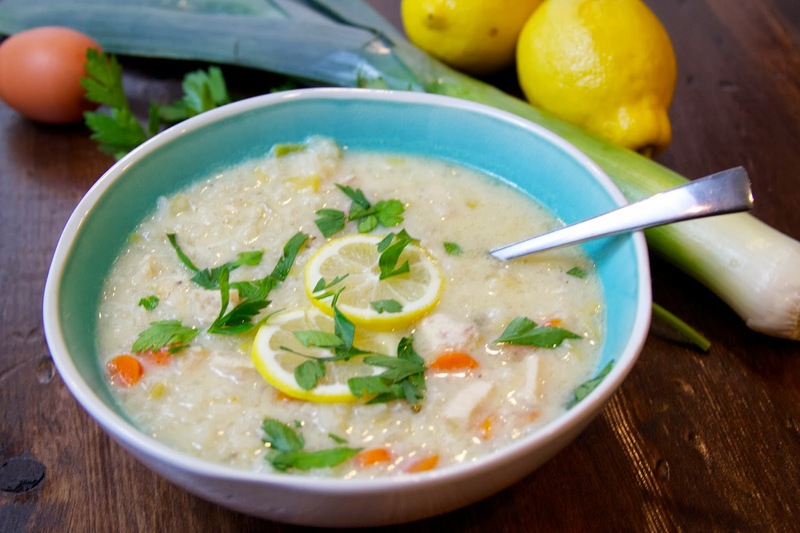 I love the tangy zip from the lemon and that the soup is creamy without using any cream. I have been walking by and sneaking ladlefuls of it all evening long. I had to put it away just so I’d stop eating it–it is that good! I adapted this recipe by Cat Cora. My version of the soup is a little less fussy, a little more rustic and perfectly easy for a weekday meal. 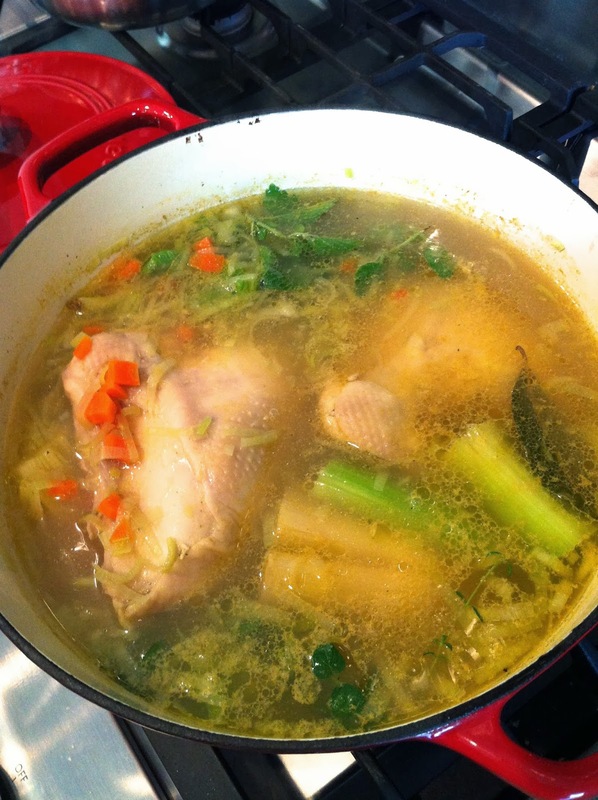 Instead of starting with a broth from scratch from a whole chicken and water, I make what I call a “double-chicken” broth–chicken pieces cooked in chicken stock, which speeds up the soup making process and allows you to use less meat. Always use bone-in, skin-on chicken when making soup–it’s more flavorful and less expensive, too! 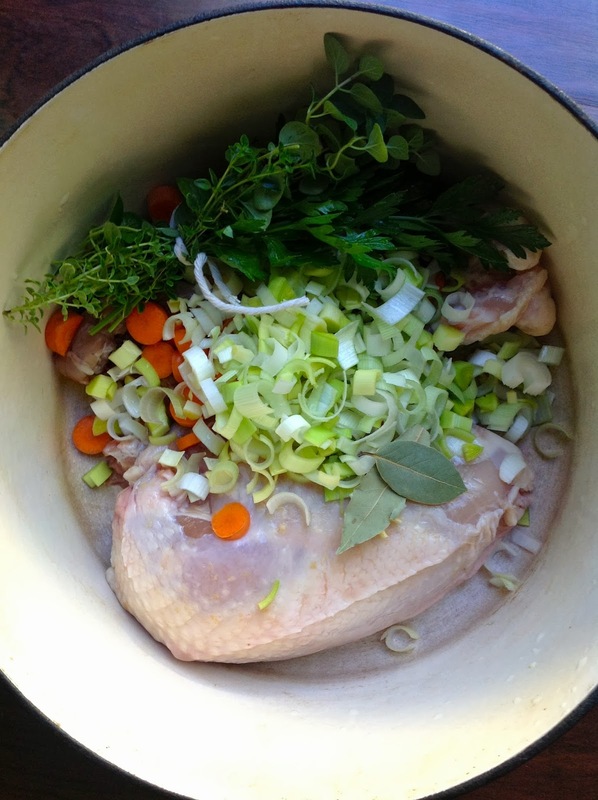 Place the chicken pieces, sliced leeks, carrot, bay leaves, celery and the bouquet garni in a soup pot. Add the chicken stock and 1 teaspoon of salt and pepper and bring to a boil, then lower the temperature to low. Skim off any foam that comes to the surface and discard. Simmer for approximately 45 minutes or until the chicken is completely cooked. While the soup is simmering, sauté the chopped onion in the olive oil on medium heat for about 5 minutes until it softens. Remove from the heat and set aside. When the chicken is done, remove from the pot and allow it to cool. Remove the bouquet garni, the celery stalk and the bay leaves from the pot and discard. After the chicken cools, remove the meat from the bones and chop into pieces and set aside. Raise the temperature to high and add the rice and the sautéed onion to the soup. Bring the soup to a boil, then lower the temperature to low. Add the chicken meat back to the pot and simmer for approximately 20 minutes, or until the rice has cooked through. In a medium sized bowl, whisk together the eggs and the lemon juice. You will need to temper the egg mixture before adding it to the pot of soup by slowly adding two ladlefuls of the hot broth to the egg mixture while continuing to stir. After the egg mixture has combined with the hot broth, add the egg mixture to the pot of soup and stir until well-blended. Add the remaining 1/2 teaspoon of salt if needed. Simmer for about 5 minutes more and garnish with chopped parsley and some additional chopped oregano if desired.